Firstly, congrats to the US Women's basketball and 4x400 relay. Both won gold in their respective concluding matches. 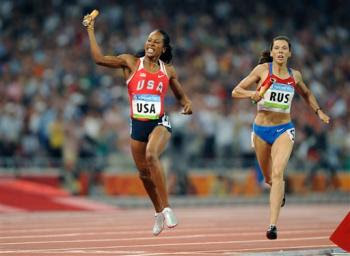 Sanya Richards' final leg on that relay was one for the ages. Also, Rogers and Dallhauser for that beach volleyball win the other night. I was concerned during that second set, but they went crazy in the third. I usually run pretty critical here, but I want to take a moment for a tip of the hat to NBC/ Universal for their coverage of the Olympics. Especially in the last week. I may not always love their commentators, but NBC has fully taken advantage of the 13 hour delay to really deliver on condensed coverage, especially of Track & Field. I want to see who wins high jump and long jump, but I don't want to watch all fifteen rounds. Highlights will work. So they've done a great job of taking, say, the last few rounds of high jump and inserting them into the middle of the 5000m race, etc... then cutting back to the 5000m for the conclusion. One huge programming suggestion for London? Javelin, discus, hammer-throw, and a lot of other sports. Fact: Showing every round of diving does not make it more exciting. Costas has administered his usual fair but enthusiastic hand to his role as the US host to the Olympics. Add in multiple channels covering various sports, mostly cut for time and highlights, and its made for, honestly, TOO MUCH engaging TV. I've done nothing these last few weeks but watch sports. It's insanity. Leaguers, thanks to my self-limiting exposure, I have watched everything from Synchronized Swimming to Rhythmic Gymnastics without a 100% dedication to snark. And let me tell you, Synchronized Swimming is one of the craziest things you're bound to see in this life or any other. My mind is blown. NBC also managed to land uninterrupted coverage (no commercials) of a lot of the Gold Medal finals in sports like Beach Volleyball... so I tip my hat to NBC. Way to go Costas and Co.
With the buzz of excitement over the success of US athletes, it seems that we sometimes forget about anyone but the winners. Sure, we salute Usain Bolt when he wins his medals and breaks world records (and that's a lot of what the Olympics are about, after all), but NBC missed some of the other stories. For example, this runner from Somalia, who came in dead last but received a standing ovation. Unpleasant though it might be, China's human rights record is far from good. And, yeah, Costas and NBC might have stood a chance of getting bounced out of Beijing, or even thrown in jail, for covering any protests... But isn't that sort of the point when you have a chance to cover this stuff? Wouldn't Costas in jail for mentioning the protests themselves give America a little bit of an idea as to how our favorite trade partner is running their ship? But the focus is on winning. Not just winning a medal, but receiving a GOLD medal. Silver and Bronze medalists were still being asked if they felt disappointed. The victory inherent in just being able to participate is given lip service, but is very clearly not how interviewers and ESPECIALLY color commentators actually feel. They can't help but talk about how an athlete who makes a mistake is simply letting everyone down. There's nothing wrong with celebrating victory, but, seriously, get a grip. Being the second or third best sprinter, pole vaulter, what-have-you in THE WORLD is no mean feat. Sometimes you can just say "Hey! Bronze medal! You've gotta like that!" And if they want to express their disappointment, goody. If the Olympics are really about all the nations coming together in the spirit of friendly competition, then it seems like NBC could do a bit more to promote that international flair. And that story is not limited to winners. Or Americans. Or putting a polish on the very real world occurring all around the games. By ignoring the world, in many ways, its reducing the impact of what it means for athletes to come together in the most idealized version of the Olympic spirit. The fact is, there's so, so much happening at the Olympics, and so many narrative arcs, that I don't know if NBC/ Universal touches on 1% of the narratives really going on. You follow the Decathalon, so you miss women's soccer. And you focus on a "sure thing" like Lolo Jones, and wind up with one of the most heartbreaking moments of the games. You focus on the amazing Phelps, but you wind up missing out on the story of the thousands of other athletes... That's the way it goes. Ah, well. We'll see how we fair with the games in London. More Olympics reporting from League of Melbotis in 2012. What? No LoM love for the Winter Olympics in 2010? Are you promising that LoM will still be around in 2012? I doubt my coverage of winter Olympics will be as... whatever this has been. I will watch, so that means I'll probably comment. Expect a lot of grumbling about too much figure skating. 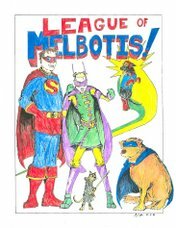 I have no idea if either I or League of Melbotis will be around in 2012. Rest assured, if we are, you'll see us talking about the Olympics. I hope London can respect the minority rights and grant full autonomy to Northern Ireland, the Falklands, Gibraltar, Wales and Scotland. Oh yes, almost forget, London must open it up unconditionally for any form of protests. Stop arresting protesters just because the police did not approve it. We have endured that for too long. I suspect the effort in China was fairly informal, and that didn't help things. Get organized now. Educate the international media (Americans, and I'd assume, much of the rest of the world, will want to know what the story is and why they should care). I wouldn't count on the police just letting protesters have free reign of the city, Olympics or not. So start now figuring out how to work with the police and city government.